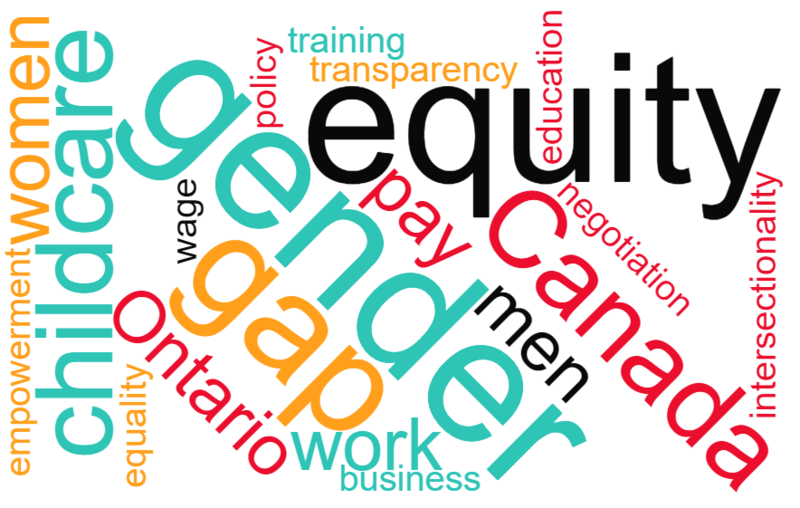 Despite extensive, detailed documentation from Ontario, across the country, and around the world, certain myths about the gender pay gap still persist. Read on for responses to some of the most common ones. If you do the calculations properly the gender pay gap disappears. The Equal Pay Coalition uses the average annual earnings of all workers in Ontario when calculating the gender pay gap. This speaks to the total picture. About two-thirds of part-time workers in Ontario are women, many of whom are limited to part-time work as there is no affordable option for child care or a lack of full-time work opportunities. Even when looking at only full-time workers or hourly wages, a substantial pay gap exists. The pay gap exists no matter how you calculate it. The pay gap only exists because women are bad at negotiating pay. It is not an individual woman’s responsibility to ensure that her human rights are being upheld. It is the responsibility of government and employers to do so. Ontario does not have pay transparency laws, making it difficult for women to know what an employer’s pay practices are. Since women experience relatively lower pay across their career, the only reference point they have for negotiating pay in a new job is their former position in which they were likely also underpaid. A recent Catalyst Canada report found that MBA female grads made $8,167 less than their male counterparts in their first post-MBA job. That’s discrimination right out of the gate. This is why the Coalition is calling for a pay transparency law to shine a light on an organization’s pay systems revealing gender bias. This will empower women, employees, employers, union and other equality seeking organizations to take appropriate actions. The pay gap only exists because women choose lower paying work. No one chooses to have their work undervalued and underpaid. This should go without saying. One of the primary causes of the gender pay gap is that jobs that are associated with ‘women’s work’ are underpaid. Think of any job in the ‘caring industry’ such as nurses, midwives, and personal support workers. It isn’t that women choose jobs that are in lower-paid industries, it is that women-dominated industries become less respected and less well-paid occupations because women do the work. The pay gap only exists because women choose to leave their careers to raise children. Of course there are some women (and men) that willingly and happily leave careers to raise children. However, women are still expected to take on the bulk of child and elder care, willingly or not, and without widespread affordable and accessible childcare women’s choices remain limited. It is not fair to call this a choice when many women have no other option. Steps need to be taken to ensure women and men more equally share care obligations, and employers and governments play their role as well. The pay gap only exists because women don’t invest in their training and education. Statistics Canada tells us that more women than men aged 25 to 34 have bachelor, medical, and master’s degrees in Canada, and in fact, the pay gap increases with education. Efforts to close the gender pay gap harm men. It is straight up illegal for a company or organization to achieve pay equity by lowering men’s pay. So, for example, raising the pay of personal support workers would not result in a sudden decrease in pay for truck drivers. Additionally, men who work in occupations dominated by women will only see their pay and value rise as we recognize the worth of work traditionally done by women. We can’t afford to close the gender pay gap. Some argue that Ontario cannot afford to be leaders on “social justice” issues. They say that pay equity laws which have increased wages earned in ‘women’s jobs’ must be abolished because it’s too costly, or a ‘frill’ that interferes with global competitiveness. Pay equity is not a privilege or a frill. It is the law. The right of those doing ‘women’s work’ to be paid on the same basis as those doing ‘men’s work’ is a fundamental human right of Ontario women which is guaranteed by provincial human rights laws and by international commitments made by Canada. Additionally, International bodies such as OECD continue to release reports explaining that improving female labour market outcomes such as pay is a cornerstone for strong economic growth. The gap has been around so long, proving that change is impossible. Ontario’s gender pay gap has narrowed significantly since 1987 when the provincial government first passed the Pay Equity Act. But when women are earning almost a third less than men, we have work yet to do. 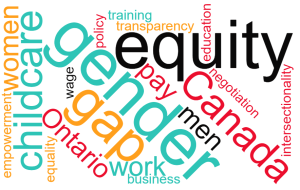 Women who are racialized, Indigenous, migrants, immigrants, LGBTQ, and women with disabilities face unique barriers that need to be addressed through employment equity laws and other measures. Also, access to affordable child care and collective bargaining are part of the roadmap to closing the gap. Read the Equal Pay Coalition’s “12 Steps to Closing the Gap” for a comprehensive strategy to close the gender pay gap.